This is a blog about music, photography, history, and culture. These are photographs from my collection that tell a story about lost time and forgotten music. 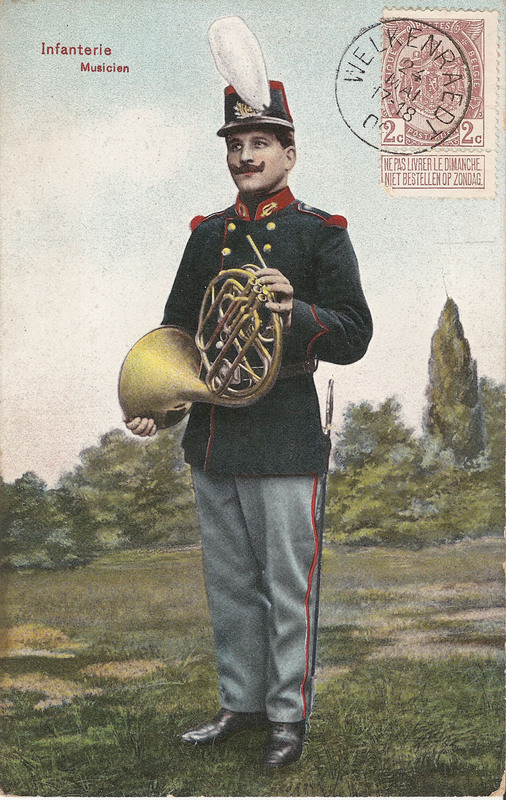 Military bands have always been a popular subject for postcards, but images of individual bandsmen are less common. This postcard from 1908(?) shows a horn player from an Infantry Band of Belgium. The card has been colorized, presumably in the correct blue and red hues for his uniform, and was undoubtedly part of a series of bandsmen cards printed by Dr. Trenkler Co. Bruxelles. Note his sword hilt visible just at his back. Curiously, his horn has no mouthpiece. His instrument is a piston valve horn, which was the design commonly found in France and Britain during this era. Germanic countries favored horns with rotary valves and that style has become the standard for the modern instrument. But the piston valve horn was equally popular, especially for military bands. The older natural horn or hand horn which uses no valves, was still common in France up to the end of the 20th century. Compare him to two other army horn players who used piston valve horns - Adolf Adel from 1896, and the West Kent Bandsman from 1914-18. The card was sent from Welkenraedt in Belgium's eastern Walloon region to a Captain Felix de Prat in Leganés, Spain. The simple signature with the number 65 is not clear to me, but I'd like to think there might be some significance in the choice of a bandsman postcard. Perhaps Felix was a horn player too. The geography of Europe made the small country of Belgium the crossroads to many conflicts, including both World Wars. But an even smaller country is Luxembourg, which is nestled just between Belgium, France and Germany. Officially known as the Grand Duchy of Luxembourg, like Belgium it is also a constitutional monarchy, and equally proud of its military band traditions. This circa 1905-10 photo postcard shows the Luxembourg Military Band posed with their instruments in a formal but relaxed manner. Their uniforms look similar to the Belgian bandsman, but without the shako plumes which would have distracted. There are 5 piston valve horns, showing the way the instrument's crook can be turned allowing the horn to rest easily on the ground. The crook is a removable coil of tubing and comes in different sizes to change the key of the horn, which are usually in F but E flat was also common. 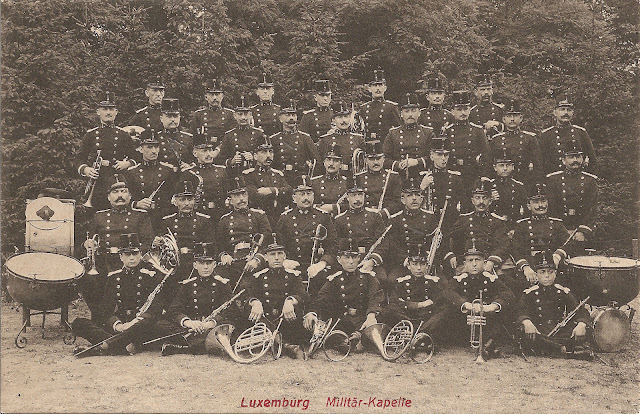 But because Luxembourg is so small, there is actually only one Luxembourg Military Band whose musical traditions continue today. The website for the Luxembourg Army History even gives a roster of the bandmasters. (1872-1957) served as bandleader from 1909 to 1937, and I believe he is seated in the center of the band, either the officer with sword or just to the left. This illustration from 1925 comes by way of Wikipedia and shows Mertens with his predecessors. He was also Belgian, and composed a number of marches for band and a few operettas. 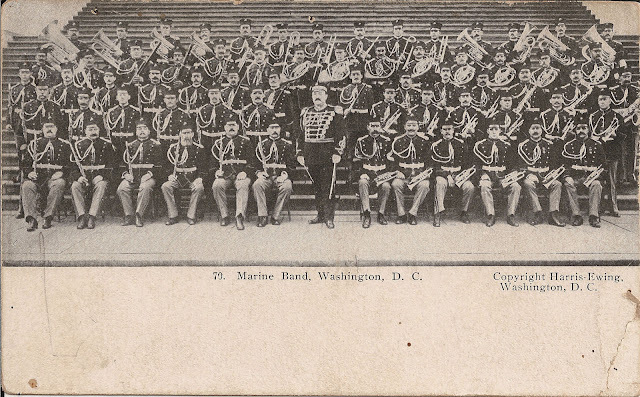 For contrast here is the U.S. Marine Band from the same period before the Great War. It is arguable which band has the greater proportion of mustaches. This postcard has the more typical formal pose for military bands and shows 8 horns in a line. All appear to have rotary valves except for possibly a piston valve (1st L) and even one without valves (3rd L). This would likely indicate the country of the bandsman's musical training, as the band took on musicians from many different cultural backgrounds. Standing in the center is William H. Santelmann (1863-1932) who served as bandleader from 1898 to 1927. He was one of many German musicians who immigrated to America and found employment in the Marine Band. His son, William F. Santelmann, continued in his father's tradition and served as director of the Marine Band from 1940 to 1955. I love the look of the colored postcard with its carefully placed stamp and clear postmark. I wonder if the first card was number 9 of a series of cards sent at one time. I run into that sometimes, where someone write a message and continues it from one card to the next. if so, I guess this would have been the last one. Thanks Christine. I hadn't thought of that, but it would explain the cryptic message if it was some kind of postal puzzle. I have some French cards that were sent like that to a soldier in Algeria. And chess was often played this way by postcard too. I'm no musician but do moustaches protect the top lip when they are playing. Like that first card. That’s a great suggestion about the postal puzzle. It makes that very fine postcard even more intriguing. 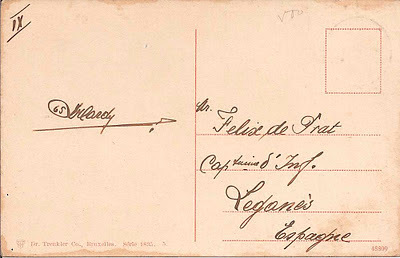 What a mystery ... "65 Irlardy" in Welkenraedt, Belgium to "Mr Felix de Prat" Captain of the Infantry in Leganes, Spain and, as you say, presumably some connection with a military band. Good idea of Christine's! I particularly like the first image, but I am bereft of ideas as to a solution, I'm afraid. As always - wonderful images. perfectly presented. I have managed to get you a band for this coming week, but with a sad absence of brass instruments. Another delightful post with wonderful images. Your knowledge of musical history is amazing. Once again, I am stunned by the postcards that are available. This is a web gallery of antique photographs of musicians. Most are of people whose names are now lost in time but they represent the many kinds of players, instruments, and ensembles that once defined musical culture. But these photographs also capture a moment in the history of people and places, so I write about that too. All the photos shown here are in my personal collection. For information on my music for horn - go to the bottom of this column.